A second change in the labor market is plummeting U.S. manufacturing employment since the 1980s, which reduced the physical demands of work. But myriad working conditions remain relatively poor for less-educated workers and are still a powerful reason for them to retire. Social Security reform has increased the retirement age at which the full benefit becomes available, pushing people to postpone their retirement. Yet this incentive is weaker for less-educated workers, despite their greater reliance on Social Security. Since they have generally shorter lifespans, a retirement delayed translates to fewer benefit checks – and smaller financial gains – over their years in retirement. Working wives. Women’s opportunities in the labor force have improved immensely over the years and many are either directly or implicitly encouraging older husbands to keep working so the pair can retire simultaneously. But, again, high school-educated men are at a disadvantage. Their marriage rates have seen a sharper decline – from 88 percent to 64 percent in a decade – than the population’s overall decline. So fewer high-school-educated men are feeling the pressure from a working wife to postpone retirement. Maybe I missed it, but the most obvious reason less-educated men retire earlier is that their jobs tend to be more physically demanding. If you are a doctor or lawyer you might be able to work into your 80s, but if you work for the highway department or in construction or in a factory that is far less likely. The elimination of mandatory retirement might explain some of this. The present value of lifetime Social Security (SS) benefits that are commenced prior to full retirement age are often very comparable to lifetime SS benefits commenced at full retirement age. 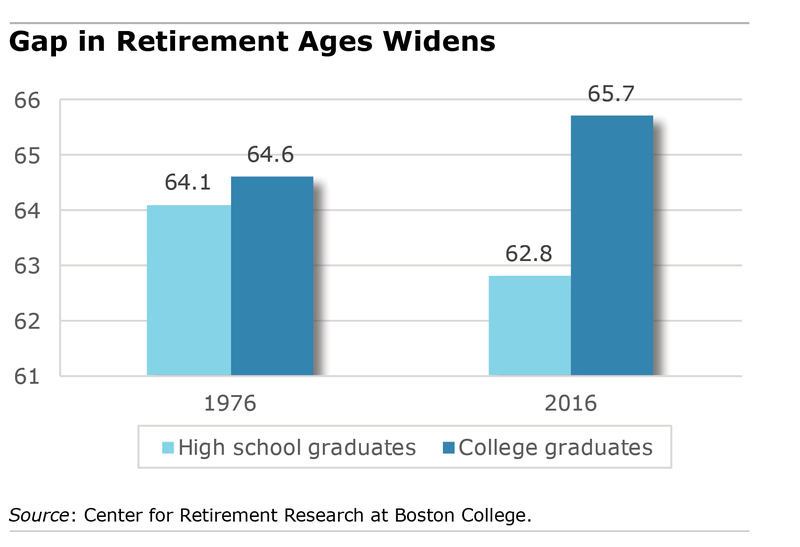 Often the break even age where SS benefits at full retirement age are greater than SS benefits prior to full retirement does not occur until the late 70s or early 80s. Thus, anyone, whether college educated or not is often wise to start receiving benefits at an earlier age if there are health reasons.